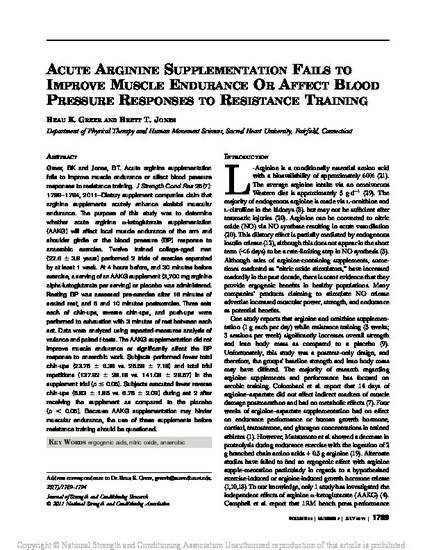 Acute arginine supplementation fails to improve muscle endurance or affect blood pressure responses to resistance training. Dietary supplement companies claim that arginine supplements acutely enhance skeletal muscular endurance. The purpose of this study was to determine whether acute arginine α-ketoglutarate supplementation (AAKG) will affect local muscle endurance of the arm and shoulder girdle or the blood pressure (BP) response to anaerobic exercise. Twelve trained college-aged men (22.6 ± 3.8 years) performed 2 trials of exercise separated by at least 1 week. At 4 hours before, and 30 minutes before exercise, a serving of an AAKG supplement (3,700 mg arginine alpha-ketoglutarate per serving) or placebo was administered. Resting BP was assessed pre-exercise after 16 minutes of seated rest, and 5 and 10 minutes postexercise. Three sets each of chin-ups, reverse chin-ups, and push-ups were performed to exhaustion with 3 minutes of rest between each set. Data were analyzed using repeated-measures analysis of variance and paired t-tests. The AAKG supplementation did not improve muscle endurance or significantly affect the BP response to anaerobic work. Subjects performed fewer total chin-ups (23.75 ± 6.38 vs. 25.58 ± 7.18) and total trial repetitions (137.92 ± 28.18 vs. 141.08 ± 28.57) in the supplement trial (p ≤ 0.05). Subjects executed fewer reverse chin-ups (5.83 ± 1.85 vs. 6.75 ± 2.09) during set 2 after receiving the supplement as compared to the placebo (p < 0.05). Because AAKG supplementation may hinder muscular endurance, the use of these supplements before resistance training should be questioned.